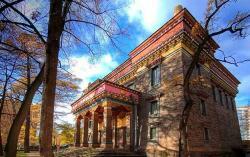 The Buddhist Temple is situated on Primorsky Pros­pect in Staraya Derevnya district. At the beginning of the 20th century that place was a quiet suburb of St Pe­tersburg. The temple was opened to the initiative and with the support of the Dalai Lama XIII. Dalai Lama is the head of Lamaist church in Tibet. The building of the Buddhist Temple was erected be­tween 1909 and 1915. The temple was designed by the architect Gavriil Baranovsky. The architect worked with the Buddhist scientist Agwan Dorzhiev. The prominent Buddhist scientist came to the city from Lhasa specially for this purpose. The site for the temple was chosen by the author of the project. The architect used the motives of medieval Tibetan architecture in the design of the temple building. The southern façade of the temple is the main one. The build­ing is rectangular. It is decorated with an original porti­co of four quadrangular pillars. They support the rec­tangle of the pediment. The wide granite staircase leads to the portico. The walls of the temple are faced with red-violet granite. The mass of the building gradually narrows upwards. The building of the temple is com­pleted with a red brick ledge. Unfortunately, the gilded bronze discs installed in its frieze were pillaged after the revolution. The north side of the building is connected with the four-storey tower. The tower is roofed with a copper gilded tent. One of the main decorations of the temple building is the eight-radius circle. On the sides of it there are cop­per-gilded figures of gazelles. The Buddhist Temple changed many owners over the last 75 years. The temple was closed and the services weren’t held in the temple. The inner and outer condi­tion of the temple is bad. The temple wasn’t restored. In 1990 the building was returned to the St Petersburg Bud­dhist Community.